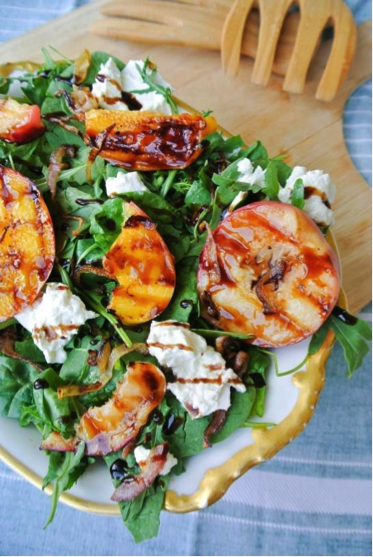 For the salad: Place the peaches in a bowl and drizzle with 2 tablespoons Spinelli’s Balsamico dressing. Toss well. Place on the grill and cook for 1 to 2 minutes on each side. Use a wide, thick-bottomed sauté pan for maximum pan contact with the onions. Coat the bottom of the pan with olive oil. Heat the pan on medium high heat until the oil is shimmering. Add the onion slices and stir to coat the onions with the oil. Spread the onions out evenly over the pan and let cook, stirring occasionally and until your onions are the color of caramel. Take off of heat. (Depending on how strong your stovetop burner is you may need to reduce the heat to medium or medium low to prevent the onions from burning or drying out. This could take 30 minutes or more). Place greens on serving platter. Layer caramelized onion on greens, top with grilled peaches and top with Burrata cheese. Drizzle more balsamico on top.